Tendon Makino Teramachi is on the always busy Teramachi Shinkyogoku Shopping Street. This tempura rice bowl specialty restaurant was recently started by the company that also runs the restaurant chain Marukame Udon, and it has been creating a stir on social media lately. The reason for this stir is of course the looks of the dishes. When the luxurious bowlful of tendon is brought to the table, shouts of joy and camera shutter sounds can be heard all around. Makino’s tendon is not only breath-taking, but the taste is also exceptional so I couldn’t put my chopsticks down. There was no oily aftertaste. The reason for this deliciousness is their policy of frying the tempura after they get the order. They never, no matter how busy they are, fry tempura in advance. Because they only fry the tempura after they get the order, you can always enjoy just-deep-fried tempura. The first floor counter seating is right by the kitchen so you can see the tempura being deep-fried right in front of you. It’s fun to wait for the tempura while watching them fry it. Recently many women also go to this restaurant to taste the delicious tendon that looks great in pictures. Please check out Tendon Makino at Teramachi Kyogoku Shotengai shopping street! This is Makino’s recommended dish, TENDON Ro. The sight of this much tempura is jaw-dropping. The biggest tempura on the bowl is the conger eel one. And then shrimp, squid and clam kakiage, egg, nori, and shishito green pepper tempura, so this bowl is quite reasonably priced! There are three types of tendon at this restaurant, I, Ro, and Ha, their prices and ingredients differing a little. 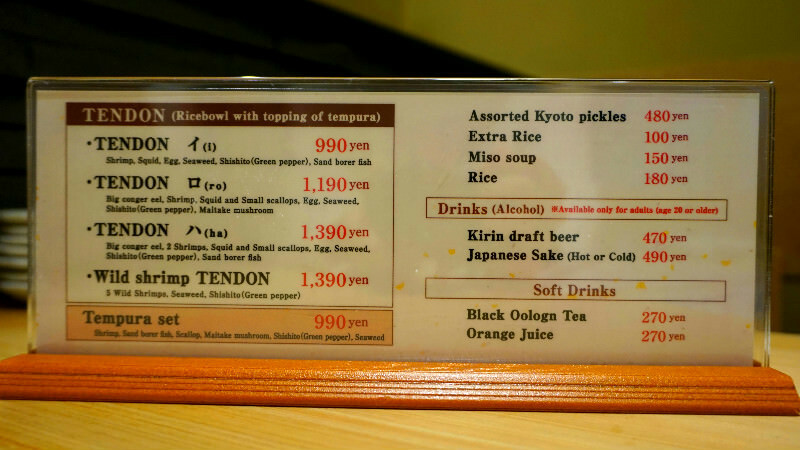 The amount and ingredients are just the right ones on TENDON Ro. First-timers should order this tendon. This is the second most popular item on the menu, Wild shrimp TENDON. Can you believe it, there are five natural shrimp tempura in this tendon bowl! The looks and the ingredients are both luxurious. There is not so much rice as you would first imagine, and the nori is mild and crispy so this tendon can be recommended for women too. 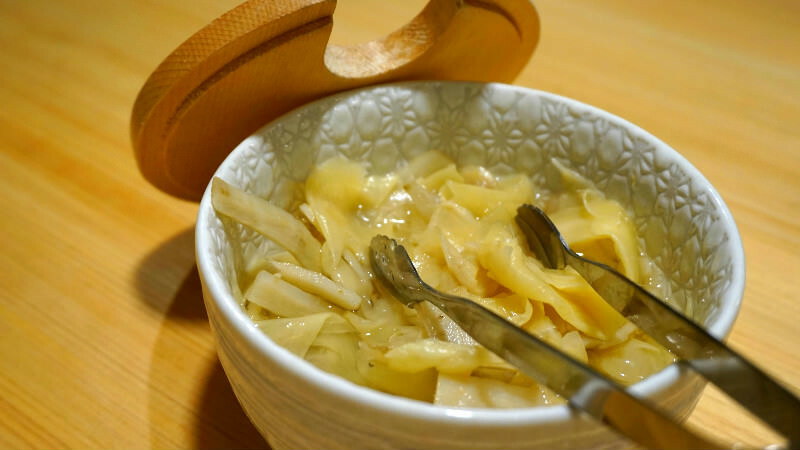 If you want to enjoy tendon lightly, you need to have tsukemono pickles. Take this chance and have some Kyoto tsukemono with your tendon! The rice with a lot of soy sauce and mirin goes really well with the crunchy and simple tsukemono. I recommend ordering these to eat as a palate-cleanser. This is the menu that is on the table. There is an English menu on the back side of the Japanese one. On the table there is also sweet pickled burdock and ginger. You can eat this for free. The aforementioned burdock and ginger can be eaten for free. You can eat it before you get your tendon, but it’s best used to cleanse your palate when eating the tendon. Let’s enjoy the tendon to the end! They also have spoons and forks, not only chopsticks at Tendon Makino. If you want to use a spoon or a fork, just mention it to the staff. This tendon bowl restaurant is on the lively Teramachi-dori Street and there is always a line in front of it at lunch and dinner times. Seeing them fry the tempura in front of you on the counter seats of the first floor is fun. The shrimp, conger eel, and others are deep fried and the fragrant crispy tempura is then covered with a special sauce, and then you can’t stop eating. I don’t usually eat lot but I could eat all of the tempura as it was not too oily. I can recommend this restaurant, so I hope you will go to have some tendon too! 8-minute walk from Subway Tozai Line Kyoto Shiyakusho-mae Station. The restaurant staff is all friendly, and while they can’t speak perfect English they will use gestures to politely serve you. They also have a menu in English so you can visit with no worries.